Snow-capped mountains are pretty typical in California — just not the peaks that got dusted this week. A series of storms has brought a rare wet winter to the state, sending snow levels plunging and creating some surreal scenes Californians won’t soon forget: Blankets of white covering vineyards in Napa Valley. Plows clearing Highway 17 between Santa Cruz and San Jose. Peaks in the San Francisco Bay Area with an alpine feel. Even San Francisco’s Twin Peaks got a light dusting. 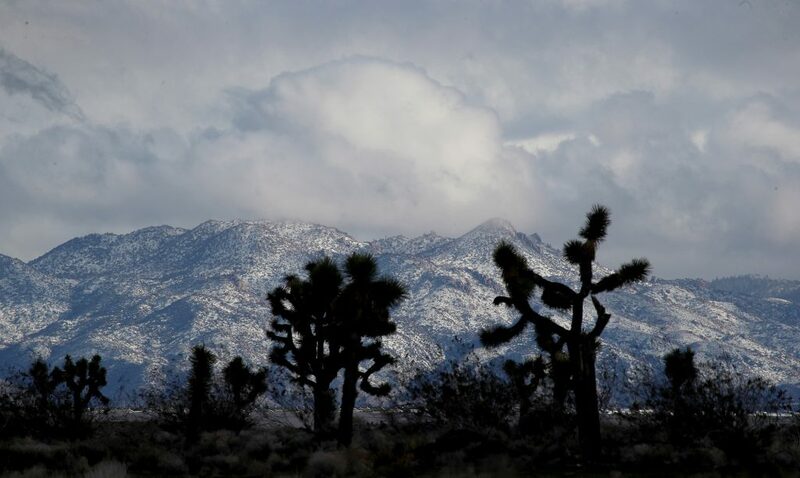 The conditions highlight a season of storms that have left their mark from the Sierra Nevada range, from which one-third of California’s water supply originates, to Los Angeles, which has endured six dry winters out of its last seven. It’s a welcome turn of events for a state that is still recovering from severe drought. “This is shaping up to be a wet year,” said Chris Orrock, spokesman for the California Department of Water Resources, citing atmospheric river events that gave the state a good three weeks of rain in January before a round of cold storms arrived at the start of February. There are no guarantees, of course. But the preliminary outlook is that Tuesday’s storm was “just the first of several cold weather storms coming into California down from the Gulf of Alaska,” Orrock said. Another could hit the state later this week. While Northern Californians are seeing a typically wet winter, the rain in Southern California has seemed more like an aberration. Downtown Los Angeles has received 12.91 inches of rain since Oct. 1 — that’s 167 percent above average for this time of year and close to the annual average of 14.93 inches. It’s also a stark contrast from last winter — the third-driest water year for downtown L.A. since record-keeping began in 1877. At this time last year, just 1.89 inches of rain had fallen since Oct. 1. Experts generally attributed the recent string of dry years to troublesome masses of high pressure that have blocked storms from dousing California during its brief wet season. The snowpack across the Sierra Nevada, California’s greatest mountain range and the state’s frozen reservoir of water, is 125 percent of average for a Feb. 5, and is 83 percent of the way to what’s typically the highest snowpack of the year, measured April 1. The southern Sierra has been particularly blessed with extra snow, currently 133 percent above normal. The Tulare Basin has received more precipitation since Oct. 1 than it received in all of the last water year. And from Sunday through Monday morning, Orrock said, the Santa Barbara and Ventura areas received about 6 inches of rain. “So Southern California, which kind of trailed a little bit behind the rest of the state, has caught up and is above average as far as precipitation goes,” he said. This winter, North America has seen polar vortex events that have delivered exceedingly cold temperatures and heavy snowfall across the Northeast and Midwest — but also wet, cool storms out of the northwest Pacific Ocean with an occasional enhancement from the subtropics, known as the atmospheric river, Patzert said. “For the West, it’s an ideal set up. For the Midwest and the Northeast, it’s been punishing,” Patzert said. Classic, cold winter storms from the Gulf of Alaska are seen as particularly beneficial for the state. They produce plenty of snow and keep it frozen in the mountains — important to retaining a reserve of ice that can melt slowly, lasting through the summer and fall as a key source of water for the state. Storms that are too warm can melt the snowpack too fast and leave the state short on water as it enters the long dry summer and fall months. Particularly beneficial for California is how recent storms have been relatively free of catastrophe. There’s been significant rain, but it hasn’t all been dumped at once. And that’s come as a blessing after last year’s dry spell for Southern California’s parks and yards, which are greening up. Cities of the Bay Area and the Central Valley have seen precipitation totals either about average or just shy of average for this time of year, said meteorologist Jan Null, because of a relatively dry November and December. The last time San Francisco had a truly impressive show of snow was exactly 43 years ago – Feb. 5, 1976 – when 5 inches fell on San Francisco’s Twin Peaks and an inch downtown, according to Null. Roads in and out of Yosemite National Park were closed because of heavy snow and downed trees. The kind of snowfall seen in the Bay Area on Tuesday happens roughly once in every five years, Null estimated — just unusual enough that it sent social media and broadcasters abuzz at the sight of snow dipping down to the views of commuters in Livermore driving on Vasco Road, and producing accumulations thick enough to make snowballs in the Santa Cruz Mountains and Mount Diablo in Contra Costa County. Recent Storms Ease California Drought: Is It Enough?